New Shirts! New Shoes! New Service! I’m really just blogging about new shirts. But I did just break in a new pair of running shoes yesterday. The new service thing in the headline — it doesn’t really mean anything but I haven’t slept a lot lately and had some random desire to make a play on “no shirt, no shoes, no service” and I did. 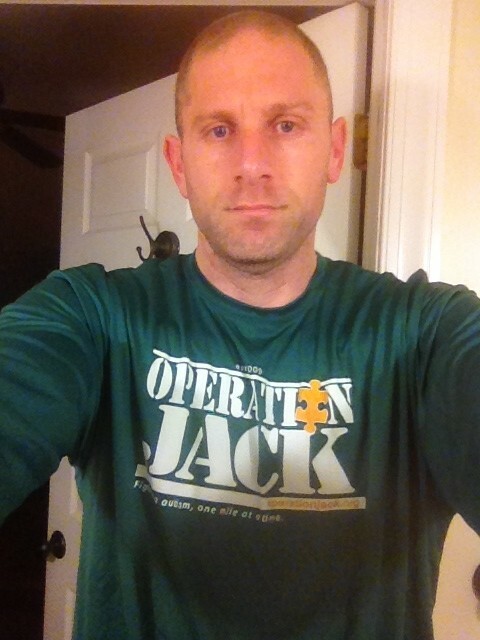 The thing I’m excited about is the new Operation Jack shirts that came in yesterday. I guess I should preface by saying that if you’ve never been here, click here to see what Operation Jack is all about, and click here to read about the Operation Jack Autism Foundation. Long story short, I’m an autism dad and I try my best to raise money for autism charities because there’s no reason not to try. I got new shirts in because I hadn’t gotten new shirts (other than shirts for the Operation Jack Marathon) in four years. I’m kind of excited about them — I like the way they look and I got some extras for myself so now I’ll be able to run in Operation Jack gear every day! I only had two shirts of the old design. Good-looking shirt. Not a good-looking guy. I don’t really have a price for them, just a suggested minimum donation of $10. You can donate here and if you do I’ll get back to you and confirm your address and ask you for your size and whether you want sleeves or not. 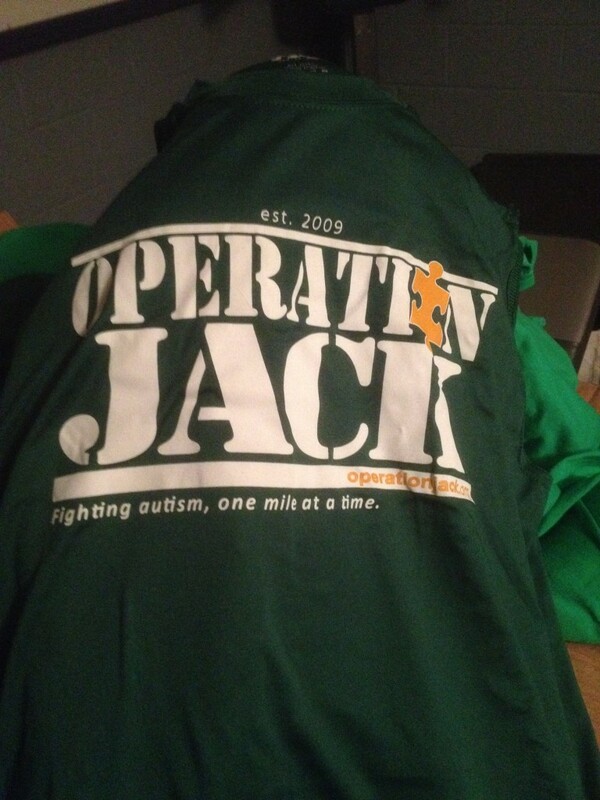 I’m not worried about these being a revenue generator — I just want people who want to wear an Operation Jack shirt to have an Operation Jack shirt. I’ve let the dollars take care of themselves for the past five years and everything has been just fine. That reminds me, I’m really excited that we were able to make a grant to TACA to help with webinars they produce for parents nationwide. We just got a check to them at the end of last week and I’m so happy when I see that the money I’ve worked to raise will help thousands of autism parents nationwide. I get locked in on trying to take care of the things on my end that I can take care of — creating shirts, putting on the marathon, running 50 miles in miserable weather last Saturday, etc. But occasionally, it’s really nice when I see the real impact it all has! OK, well that’s all for today. My wife is nagging me to get off the computer. I figure when you run 50 miles in a race and raise more than $1,000 to fight autism, you have to write a race report about it. I don’t really know where to start, though. On Saturday, in Enid, Oklahoma, I ran the All Day Run For Autism. The race was put on by Glenn McDaniel, who I’d met online through Operation Jack and talked to quite a bit over the years. The race was put on primarily as a benefit for a local organization out there called 4RKids that helps promote awareness and provide opportunities for special needs children and adults in the area. I think it was also a benefit for the Operation Jack Autism Foundation. The concept was interesting — there was a six-mile loop and you had 90 minutes to get around. It started at 7:30 a.m. and regardless of what time you finished those six miles, you couldn’t start the next loop until 9 a.m. The next loop started at 10:30, and so on. The race was scheduled to last 30 hours or until there were no competitors left. If you made it in 90 minutes, you could run the next loop. Otherwise, you were out. tl;dr … my Facebook status saves you the hassle of reading this way-too-long race report! I collected pledges raising money for the Doug Flutie Jr. Foundation for Autism and each mile I ran was worth $20.50. Going into the race, I had never run farther than 54 miles, and I had only run 20 miles once in the previous six months, but with money for autism on the line, I was determined to give it my all. I knew I wasn’t in shape and I’d fatigue, but I was optimistic that I could gut out 15-minute miles for a while after I slowed down. Objectively, I expected to run 36 to 42 miles. I had dreams of a new distance PR (more than 54 miles), somewhere in the 70s, and even that bucket-list 100-miler. I didn’t have any reason to legitimately think I could accomplish any of those, and going in I figured I’d be disappointed with anything less than 54, but there was really no basis to think I could do that. No sense not trying, though? The weather in Enid was great on Friday and Sunday, calm skies, mid-50s. On Saturday, it was a different story. When the race started, it was probably somewhere between 25 and 30 degrees and I heard somebody say the winds were 38 mph. It. Was. Not. Warm. I didn’t realize how bad it was the first lap and was physically in pain because I didn’t have the right layers on. I got through the lap and had about 35 minutes to wait. I warmed up insde in the tent that was there with some incredible heaters and dressed the way I dress when it’s zero degrees back home. They did a great job with the aid station inside the tent. Plenty of all the typical ultra food you would expect and I made sure to start early with the nutrition. I’m not too experienced with ultras — maybe a half-dozen or so under my belt, but I wanted to be sure I took care of myself before it was too late. It was a little weird starting up after a 35-minute break, and it was such a bummer to go from that warm tent back to outside! Once we got going, the cold didn’t seem as bad as it did on the first lap. Yay, layers. I was getting a headache on the right side of my head when we were running west, because the wind was coming pretty hard from the north. I started to sense that it would be one of those days that might not be all that fun throughout the day, but it would be fun to write about and reminisce about. War stories are fun to have, but not to create! During the second half of that second loop, it start sleeting pretty good and with the wind slinging it, it stung when it was hitting me in the face. I got through the loop without any significant trouble. I discovered something that made it tough after that second break — when you go from really cold to really warm, it makes you really, really want to take a nap. All I could think of was sleep and I was only 12 miles into this! During the third lap, it started snowing. The flakes were pretty good size, but it was better than the sleet. It was getting a little tougher at the beginning of each lap to get going after the break. One good thing about the break, though, was that I was mentally viewing each loop as a six-mile run. I wasn’t think so much about the actually total of the run. When I got around to the end of that third loop, it didn’t seem like I was 18 miles in. It just seemed like six miles. Again. I continued to get sleepy during the break and as appealing as it would have been to take a nap, I knew that wasn’t an option. By the start of the fourth loop, though, the stiffness started to kick in. My legs felt like they do when I run the day after going all-out in a marathon. I wasn’t alone — we were all struggling to get going, shuffling for about a half-mile before our legs would kick in. It was still snowing on the fourth loop but I think it started to ease up. The wind wasn’t as bad as it had been, although it picked up at times. By the time I was finished with the loop, I didn’t feel as exhausted as I normally do after 24 miles. I think that’s mostly because of the mently aspect, because I really wasn’t thinking about anything beyond six miles. It didn’t mentally seem like 24. I went in again and it was the same routine — text, tweet, Facebook, warm, warm, food, warm, sleepy, “one minute and we start again!” … those are the worst words ever! The fifth lap got us past the marathon distance of 26.2 miles, so that officially made it an ultramarathon. If memory serves correct, it was still a little windy, but the snow had stopped. When we got back to the start/finish, Glenn was there and slapped me a high-five and said, “Congratulations! You went ultra for autism!” I spent most of my time running alone and had plenty of time to think about what I was doing and why. I knew I wouldn’t have been out there if not for Jack and the long, long journey we’ve been on with him and Operation Jack. It just felt different and special to hear him say that. It was about 2:30 p.m. at that point and even though I was 30 miles in, I knew I still had a long ways to go. I went through the same in-between-laps routine and got back out there. My legs really felt stiff when we got going for the sixth lap and as I was telling people I was communicating with, I knew that this was the point where the breakdown and fatigure would probably start to happen. Even if you’re in shape, you’re going to start feeling things after 30 miles. And the starting and stopping made it difficult and the weather wasn’t great. The wind had died down to less than 10 mph at this point and it was warming up a touch, maybe high 30s or even 40, and I actually was doing better than I thought I would be. I got through the lap fine and was pretty optimistic that I’d be able to get past 54. After another break and more nutrition and hydration, I dragged myself out for a seventh lap. It was starting to get a little tougher just because that tent was so warm and I kept getting sleepy! I was moving around and felt like I was slowing down, but felt like I still had a lot in me. I was having no troubles all day staying below 10 minutes a mile, so I knew that I could go for a while and stay below the 15-minute pace I needed to beat. But about two miles into that loop, I could feel some problems in the IT band in my right knee. I was 38 miles into my day, and I knew I was untrained, and what was happening was, unfortunately, not a surpise. The issues with my knee were coming and going, but I was moving OK and I knew I’d get in with plenty of time to spare. I wasn’t confident that I had more than another lap in me after that, but I knew I’d go out for at least one more loop. The loops were actually 6.1 or so miles, so I got in and was was 42.85 miles into my day. I’d earned $861 so far. One more loop would get me a bonus mile because of the extra .1 and change and put me at $1,004.50 from my pledges. I was kind of thinking that this was the way it was going to end up, 49 miles, about $1,000, done for the day. That was what I was telling myself just being realistic, although I was also hoping that maybe I could find a way to get to 55 and get a new distance best. When that eighth lap started, I was stiff, like I had been for the start of the previous four or five laps. But while I eased into a 9:30 pace within a half-mile or so of the start of each of those laps, the second mile of that eighth loop took me about 13 minutes. I knew I was done, that I would just enjoy that lap, because it was going to be my last. My knee was getting progressively worse, and while not tremendously bad, I didn’t think there was a whole lot left in it before injury. The snow melted and the course was getting pretty squishy. About two miles into that eighth lap, I was running north and got an incredible sense of peace. The course was along dirt roads surrounding farms and when you were alone (which was pretty frequent over the final three or for loops for me), all you heard were cows and your own footsteps. The sun was setting off to my left and it was a nice, bright orange/red. I knew I was done and just started talking out loud to myself. I told myself that I tried hard and while it wasn’t necessarily the best I’m capable of, it was the best I was capable of that day. I would have loved to have quit after 30 miles, but I pushed on because I was raising money. I felt like I pushed myself and didn’t feel any shame for what I did that day. 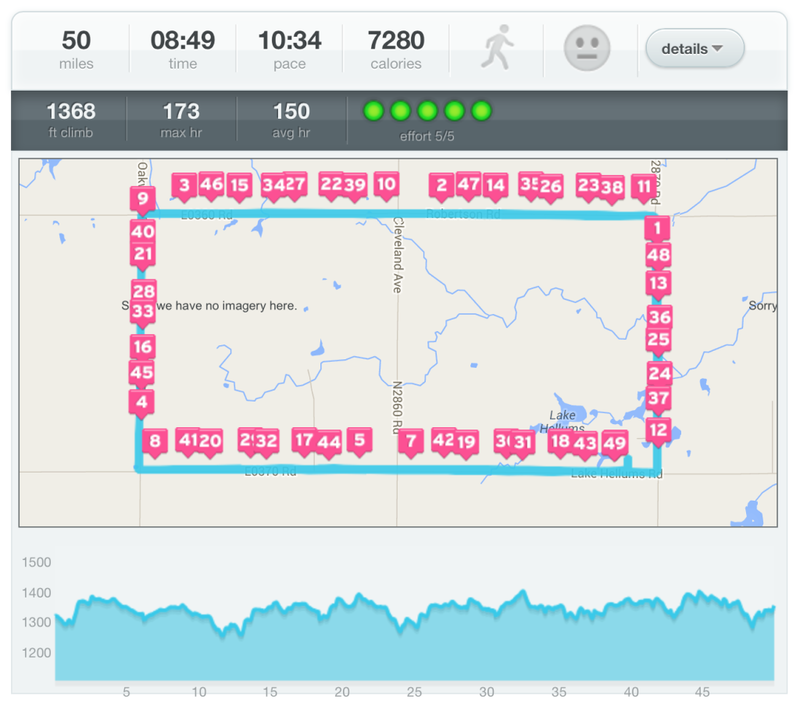 I think the Dailymile graphic looks kind of funny with the miles all over the place along the loop. I was also extremely grateful for being able to be in the position to be out there. If not for the work for Operation Jack I’ve put in over the years, using running to fight autism, there’s no way I would have been able to experience that serene sunset in Enid, listing to the cows and being able to enjoy the peace that comes when you’re completely alone on a run. There were times when there wasn’t a person within a half mile of me and I really enjoyed the calm. I had a very long week as a parent and it was nice to get some perspective time. I got in to the finish, a football field shy of 49 miles, and went back out just a little bit to hit 50. It’s not very often I get a chance to run 50 miles (this was only my fourth time ever), and I knew I would have kicked myself for a long time if I called it quits at 49! So, in all, 50 miles, $1,025 miles raised for autism. I would have loved to have done more, but I was grateful just for the opportunity to be out there and participate. It was a great event, very well done, especially for an inaugural event. I’d love to get back out there next year and run it again. Individually, I just feel so blessed that I’m able to get out there and run and make something happen, not matter how big or small. If you’ve never been here before, this is Operation Jack, something I created in honor of my severely autistic son Jack. Back in 2008, I decided I wanted to fight autism, because Jack fights autism and that wasn’t his decision, and I had this dream that I could make the world a better place. Kind of simple and naive, but whatever. It’s nicer that way, right? My initial plan was to run 60 marathons in a single year, and I did that in 2010 (well, it actually ended up being 61 — who likes round numbers?) to raise money and awareness. I never had a plan and aside from offering shirts and sweatshirts to donors, I never really asked for money. It just came in, which was awesome. Close to $90,000 came in and the endeavor only cost maybe $25,000? 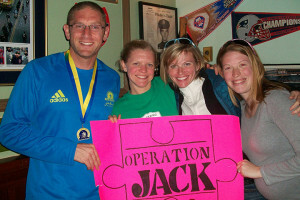 From there, we created the Operation Jack Marathon, and this year we’ll be having the fifth-annual running of the race! 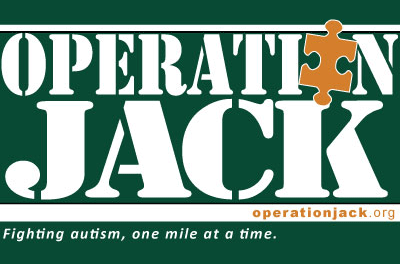 In all, the Operation Jack Autism Foundation has grossed more than $240,000 through the Operation Jack Marathon, other races I’ve put on and my running efforts. I’ve never earned a nickel, and aside from the times when I’ve offered incentives or contests (gift cards, shirts, etc. ), I’ve never really asked for a nickel. So I’m trying something here, and for the first time in five years, I’ll say to anybody who’s followed along and appreciated the effort I’ve put forth trying to raise money and awareness to fight autism. This is the one time I’m really directly asking, would you please consider supporting my efforts with a donation? Next weekend, I’m running a race in Oklahoma called the All Day Run For Autism. It’s a race that will primarily benefit a local organization there called 4RKids that helps promote awareness and provide opportunities for special needs children and adults in the area. My foundation will also be a beneficiary, which means that some of the proceeds will go to help a small autism organization somewhere that needs the help. But individually, I’m running the race to raise money for the Doug Flutie Jr. Foundation For Autism. The race is a six-mile loop and timed loops start every 90 minutes. Make it back in time, and you can participate on the next loop. So, I’m figuring I’ll probably go and a moderate effort, finish the first loop in 51-53 minutes, and then wait around for 37 or so minutes for the next loop. And then repeat. The race goes for 30 hours. I don’t anticipate having any problems completing the first few loops. But after a while, it’s going to get tough. I’ve run two other 50-milers, one of them last year, although I was out of shape and just kind of persevered in that race last year. I finished sixth-to-last! I’ve had one run of 16 miles or more since September 9. I’m running again, but I certainly haven’t done much lately. In the past, I might have had confidence in what I’d be able to accomplish in this race in Oklahoma, but now, I just have confidence that I’m going to try my best. This will be on the front of the tech shirt (which will be green). If you pledge a minimum of 50 cents/mile for every mile I cover, I’ll send you one. So, say I cover four laps, which would be a pretty good workout for me, and that’s all I have in me? $12. If I cover nine laps and match the longest distance I’ve ever covered, even when I was in very good shape? $27. In theory, I could complete the entire race and cover 120 miles and that would be $60, but I’m pretty sure I’d die before that happened. That would be more than twice as far as I’ve ever gone and I’m definitely not in shape for this! So like I said earlier, if you’ve followed along over the years and appreciate the effort I’ve put forth, then will you please consider making a pledge? I’m asking for what I imagine will be a $15-$20 donation and I’ll be sending you a tech shirt in return. Yes? Please? My honest assessment of what I think I’ll cover is probably 36 or 42 miles. To make a pledge, drop me a line at sam@operationjack.org and I’ll follow up with you after the race to let you know how many miles I ran. Donations can also be made by clicking here. Thanks for reading and thanks for your support! With the work I’ve done over the years with Train 4 Autism and Operation Jack, I’ve said so many times that it’s important to find a positive outlet when you’re an autism parent. Heck, it’s the mission statement of my Operation Jack Autism Foundation. To encourage parents, relatives and friends of those struggling with autism to find a positive outlet by leading an active lifestyle that promotes awareness and raises funds for autism-related charities. Fortunately, I have a couple of friends up in Maine who recently helped me realize that I needed to take my own advice. I love my 10-year-old son Jack, but his autism makes life tougher for my family year after year. It led to two relocations in about a year, financial difficulties, time loss — it’s really drained us. And individually, everything combined was definitely a contributing factor in me losing one of the few things I thought I was good at that I really enjoyed — running marathons. My training started to slip and my results started to slip and my mindset started to nosedive. It became so frustrating for me that my body couldn’t do what it used to. I felt like I lost a part of me that I really liked. Running used to be something that I really enjoyed, but it turned into something that made me really miserable. I complained all the time with my posts on Dailymile about how frustrated I was that I wasn’t how I used to be. Every here and there, I would post with some kind of comment about how I’m going to take baby steps and get back, but that mindset lasted until I skipped my run the next day. Running — and not running — was making me miserable. My positive outlet became a negative outlet. I snapped at Sarah and Danielle when they talked to me about running, because to me, it was something negative — it’s disappearance was a harsh reminder to me that my life wasn’t where I wanted it to be. I was dwelling and couldn’t see any light at the end of the tunnel because my eyes were closed. I couldn’t even congratulate them when they were having great races and workouts. They recently read me the riot act and made it clear to me how I’ve changed. I’ve been friends with them for about four years. I wasn’t the person they used to talk to. I wasn’t listening and the only thing I had to say was woe is me. After a while, that gets old, and it got old with them. I had become that guy to talk to. Running was my negative outlet. Operation Jack is a positive thing for me, but the only time I have any effectiveness with it is when I work crazy hard and run myself into the ground. That’s definitely a double-edged sword. I needed something positive and after getting it straight from my Maine girls, I knew it was right there in front of me. It was just all in the way I viewed it. I had friends demanding accountability with my workouts every day, demanding that I stay positive, demanding that I fight my way back, demanding to drop the woe is me stuff. I’m only a few weeks into it, but I’m feeling better about myself and my running than I have in years. Me, Danielle, their friend Melissa and Sarah when we met back in Boston in 2010. I joke around with them, because when we first met, none of us would have thought that I would be turning to them for motivation. I was in the middle of my 61 marathons in 2010, having just run my 20th of the year (Boston) in 3:03. That race was more than an hour faster than Danielle’s PR at the time, and Sarah was pregnant and had never run a marathon. They wanted to meet me because they thought what I was doing (running 61 marathons in a year to raise money to fight autism in honor of Jack) was inspiring. Yet here I am now, four years later, turning to them for inspiration. I’m not sure I’d want to race either of them right now — they’re both going to qualify to run Boston next year and I’m going to have really work hard to join them. Back To The Unthinkable: The Hamsterwhizzle! The last time I ran on a treadmill was September 27, 2012. While some runners have streaks and take pride in keeping those streaks going, I’ve been taking pride in not running on the treadmill. I’ve done a little too much of not running at all, but back in 2012, when I was living in Colorado, I told myself that if I was going to go to the gym to work out, then I was going to ride the bike. If I wanted to run, I had trails all around me and fresh air and I needed to get outside and have my me time. Well that streak is going to come to an end pretty soon. It’s not because of the winter we’re having here in Pennsylvania — I’ve run outside here in temps that are sub-zero with wind chill. I think I ran outside last summer when it was hot (I say I think because it’s been so darn long since it’s even been warm that I don’t really remember it ever being hot … but I’m sure it was). The real problem we’re having here is that with my wife Tiffany’s schedule of taking care of the kids and the house and me and pretty much everything, she doesn’t have the time to break away to go to the gym. Not only that, but we had a sweet deal with 24 Hour Fitness in California and Colorado ($29/person annual membership) and here I think it’s $30/month a person for the gym. That’s more than 12 times as much. So, I’m taking the discretionary part of my last bonus and buying her a treadmill for the basement. She said that would make it a lot easier for her to exercise, and that, in turn, would make her a lot happier. For everything she’s been through in the past two years supporting the family and taking care of our severely autistic son Jack, I think it’s the least I can do for her. Actually, it’s pretty much the most I can do for her (dang kids, keep eating every day and there’s no money). But I know it will help her find happiness every day, so I’m going to buy it. No hesitation. She deserves to be happy. As I type this, I can hear her upstairs dealing with another one of Jack’s meltdowns — it’s 9:30 p.m. and he still won’t go to sleep. This is every night, so I think she deserves whatever it takes to make her happy. 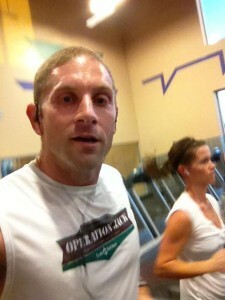 Only treadmill picture I could find. This was taken before selfie was a word. And that’s not some poor woman who got caught in the background of this pic. Well actually, it is. But it’s the missus. She misses the days when she went to the gym and was very fit. I, um, don’t think there’s anything wrong with the way she looks right now. But I know how she feels (I’m struggling to regain my fitness, too) and I want her to find that happiness she used to get when she exercised. This is what she says will help her get that, so this is what she’ll get. And of course, if it’s going to be sitting there in the basement, I’m … going to … run on it. Uggghhh. My #notreadmill streak is going to come to an end after getting past 500 days. But it will be good for me and help me add things into my training. I’ll admit it, I did like progressive treadmill runs, and I did like the treadmill for recovery runs, and they’re good for hills. I don’t want to admit I’m excited about running on it, but I’ll admit it — I’m excited about it. I’m kind of thinking that it’s going to help me tune up in some areas I need to tune up (the speed stuff will force me to improve my turnover, because there’s no slacking off when the belt is moving). Hopefully this gets me going again.